Aircraft service and maintenance are important functions to ensure safety of flight. After all, you do not want to have a maintenance issue while you are in flight. Every precaution must be taken while the aircraft is on the ground so that you arrive at your destination without incident. To properly perform aircraft fuel tank inspections and maintenance, technicians must physically crawl inside of the fuel tank if accessible. Most aircraft fuel tanks are not large enough for an average sized man to maneuver within easily. For example, the largest fuel tank of a DC-9 measures approximately 2-1/2 feet high, 4-1/2 feet wide and 4-1/2 feet long and are usually smaller on many corporate aircraft. 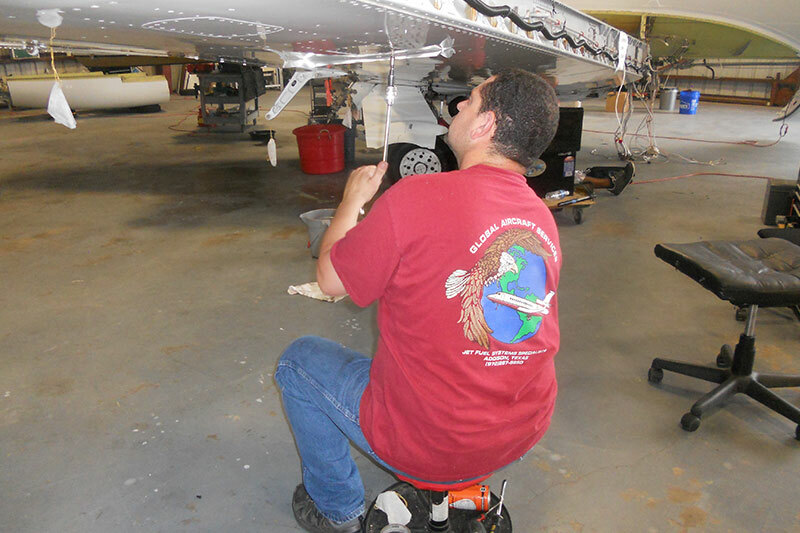 Due to the hazards of working in such confined spaces, OSHA regulations are in place to protect technicians that are required to perform aircraft fuel tank repair as part of their daily duties. Additionally, maintenance technicians face multiple dangers while performing aircraft fuel systems inspections and repairs. Furthermore, jet fuel and other chemicals used internally within the fuel tanks may also contain toxins or irritants that can have adverse affects to the central nervous system. To protect technicians from these types of hazards, specialized training and procedures are in place. Portable gas detectors are used to monitor the oxygen and flammable vapor concentrations within the fuel tanks. Oxygen concentrations should be between 19.5 and 23.5 percent. Levels below 19.5 percent are considered oxygen deficient, while levels above 23.5 percent will significantly increase the risk of fire and/or explosion. Monitoring these numbers is critical to the safety of the maintenance crew. 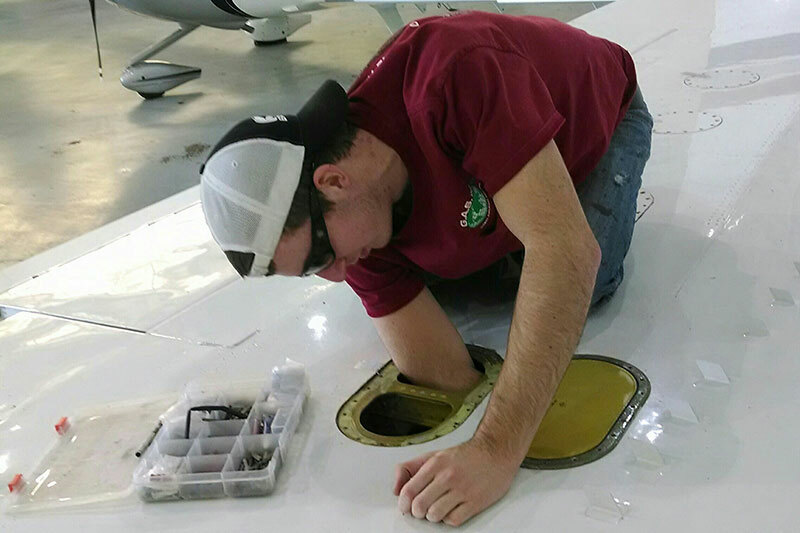 Proper training of the maintenance crew is an important component to conducting proper aircraft fuel tank repairs without an incident. These technicians must maintain constant and accurate voice communication and continuously monitor the aircraft fuel tanks and their surroundings’. All technicians must understand the many critical components within the aircraft fuel tanks, to prevent injury to personnel and costly damage to the aircraft. The unfortunate reality of aircraft fuel systems maintenance is that potentially severe issues can occur. The interior of a fuel tank can be a particularly hazardous environment. Therefore, all aircraft service and maintenance procedures should also include an emergency response plan. Appropriate training is critical to ensuring the safety of flight. Aircraft fuel systems maintenance is an intricate procedure and requires significant monitoring to ensure the safety of all involved. Proper training and effective processes will support a healthy work environment for fuel tank repair technicians by recognizing hazards and having proper protocols in place to respond to any issues that may arise.